The Rs 1,064-crore Bhanupali-Bilaspur-Beri railway line would be completed by 2014, said Chief Minister PK Dhumal here today. The feasibility survey had already been conducted and the process for acquiring land for the project was underway, he added. Realising its folly in surrendering the “first right of refusal” for power generated during summer in private hydroelectric projects, the state government has decided to review the policy of taking the entire free power during winters. Two alert personnel of the Wildlife Department arrested beat officer Des Raj red-handed while poaching in Pong Dam Wildlife Sanctuary in the Haripur area, near Nagrota Surian. Two bar-headed geese and a gun that were recovered from forest official Des Raj who has been arrested for poaching in the Pong Dam Wildlife Sanctuary. The state has made a mark in the development of fisheries by achieving the highest per hectare production in reservoirs in the country. The state is producing 7,337 tonne fish (valued around Rs 37 crore) due to the success of the fisheries programme under which selected commercial species were introduced in major reservoirs like Gobind Sagar and Pong Dam. The initiative taken by the Forest Department in throwing open its rest houses to tourists could be followed by other departments like the PWD, Electricity and Irrigation as this will not only generate good revenue, but will also help provide descent accommodation for visitors, especially in far-flung areas, sans hotels. The Rajya Mahila Ayog (State Women Commission) has been making strenuous efforts to ensure family reconciliation by mutual understanding and also sorting out of all complaints referred to it through repeated counselling so that the grievances of complainants are solved with agreement. With the guidance and encouragement of an American researcher, the efforts of the youth of tiny hamlet of Beri in Chamba district have borne fruit and the handicraft items prepared by them are going to get recognition at the global level. While Narender Thakur seems to be the front-runner among the Congress candidates for the Hamirpur parliamentary seat to contest against sitting MP Anurag Thakur, a few other aspirants are still making efforts to get the party nomination from here. Keeping in view the Himachal Winter Games Championship to be held from February 15, the Solang ski slopes were covered with nets after it experienced fresh snowfall on February 6. Over 100 residents of Bassa village of Jawali subdivision and parents of one Shivani Guleria, who allegedly committed suicide on January 21 due to harassment by her in-laws, held a demonstration in front of the residence of the Jawali SDM here today. Setting a record of appointments, 101-member District Congress Committee has been formed here with view to accommodating all sections of opinion. The list was released here recently in the presence of three district spokesmen of the party Kamlender Kashyap, Mast Ram Varma and Sat Pal Sharma. Hamirpur DC Abhishek Jain yesterday gave detailed information on the Right To Information (RTI) Act in a workshop organised by the Panchayati Raj Department for the elected representatives of the panchayats. The Life Insurance Corporation (LIC) of India has declared Thpkour village of Gagwal gram panchayat in this subdivision as ‘Beema Gram’. Presiding over a function in this connection today in the village senior divisional manager, LIC, Shimla, LC Meena presented a cheque for Rs 25,000 to the local gram panchayat pradhan for undertaking rural development in the Beema Gram. The state Prathmik Sahayak Adhyapak Sangh has decided to hold a dharna at the state capital on February 9 in protest against the failure of the government to accept their long pending demands. The state government is giving top priority to construction of roads and other infrastructure, which brings prosperity to the village areas. This was stated by BJP state spokesman and Kot Kehloor MLA Randhir Sharma while addressing a number of public meetings in connection with his “meet the people programme”, at Chalehla and Mandhyali villages, about 90 km from here, yesterday. The Rs 1,064-crore Bhanupali-Bilaspur-Beri railway line would be completed by 2014, said Chief Minister PK Dhumal here today. The feasibility survey had already been conducted and the process for acquiring land for the project was underway, he added. It would be a milestone in infrastructure development in the state and pave the way for the construction of the Bilaspur-Manali-Leh line for which the Government of India had already agreed in principle. A provision of Rs 2,000 crore had been made for the Rohtang Tunnel that would provide an all-weather link to the landlocked tribal area of Lahaul-Spiti and Ladakh. The government had also succeeded in getting sanctioned an ambitious carbon credit project to make Himachal a carbon-neutral state. He said his government had fulfilled 80 per cent of its election promises and managed to get some major projects and schemes sanctioned for the state. These included three Indian reserve battalions, a BSF battalion and a disaster management battalion. Besides, a battalion of the ITBP would also be established in Una district. Persistent efforts of the government had helped in getting sanctioned projects like a Rs 500-crore ESIC medical college, Rs 760-crore IIT, a premier institute of engineering and technology, a Rs 60-crore National Institute of Fashion Technology, a Rs 10-crore food craft institute for Kangra and a Rs 35-crore hotel management institute for Hamirpur. Other major projects included a Central University for Kangra and a hydro-engineering college for Bilaspur to provide trained manpower for hydroelectric projects. Eyebrows were raised when the government recently signed implementation agreements (IAs) that provided that independent power producers (IPPs) would supply the entire free power due as “royalty” during the winter and they would be free to sell the entire power generated during the summer outside the state. As 75 per cent of the power is generated during the summer, the government will be left with no surplus power to sell under such an agreement. Moreover, surplus power fetches very high prices during the summer. Chief Secretary Asha Swaroop, who also holds the charge of power, said a review of the policy was under consideration as it was in the long-term interests of the state to retain the “right of first refusal”. Further, power shortage in the winter was a temporary phenomenon. With a number of big projects coming up over the next three years, much more power would be available during the lean winter months and there would be no shortfall. As such, drawing the entire free power during the winter for a period of 40 years for which the IA would remain in force could jeopardise the state’s economic interests in the long run. In another important decision, the government has scrapped the “first come, first served” policy in respect of self-identified projects. All projects having a capacity of 5 MW or more will be allotted through competitive bidding. In case of self-identified projects, the promoter will be given preference if his bid falls within 30 per cent of the highest bid. He will have to match the highest bid to secure the project. The decision will go a long way in ensuring transparency in allotment of projects. It is time for the government to come out with a standard IA for projects between 5 MW and 25 MW allotted through the MoU route as signing different IAs for various projects allotted under the same policy will lead to legal wrangling. If other IPPs approach the state electricity regulatory commission or the high court for similar IAs, the government will find itself on a weak legal turf. Sources said beat officer Rashpal Singh and watcher Shashipal heard gunshots in the Haripur area. 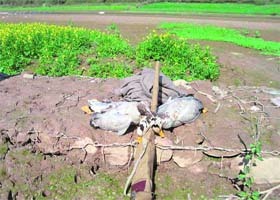 They reached the spot and caught Des Raj with two dead bar headed geese and .12 bore gun used for poaching. It was later found that the accused in the case was also a beat officer in the Forest Department. It is for the second time in less than a month that poaching of bar headed geese has been reported in the Pong Dam Wildlife Sanctuary. In the recent past 20 dead bar headed geese were recovered from the fields on the banks of Pong Dam lake in the Nagrota Surian area. None had been arrested in the case as yet. It was suspected that certain persons had spread poisoned seeds in the fields. The bar-headed geese that feed in the fields during the night consumed poison laced seeds and perished. Large flocks of bar headed geese could be seen feeding in the area along the lake. However, rapid poaching is threat to endangered wildlife bird variety that is protected under the Wildlife Act. Sources in the area said reported poaching were just a tip of iceberg and local resort to mass killing of migratory bird by poisoning or other methods as netting. The conservator, Wildlife, Dharamsala, admitted that a forest official had been arrested. He said a veterinary doctor had been sent to the spot for carrying out post-mortem of the birds. The conservator forest had been informed to take disciplinary action against the accused forest official. A case under the Wildlife Act had also been registered against the accused official, he said. The state has made a mark in the development of fisheries by achieving the highest per hectare production in reservoirs in the country. The state is producing 7,337 tonne fish (valued around Rs 37 crore) due to the success of the fisheries programme under which selected commercial species were introduced in major reservoirs like Gobind Sagar and Pong Dam. The latter also achieved the distinction of highest sale price of the fish catch in the country. In 2007-08, an increase of 350 tonne in production was registered. The three major reservoirs of Gobind Sagar, Pong Dam and Chamera together provide 42,000 hectare for reservoir fishery. Commercial fishing has made Gobind Sagar and Pong Dam reservoirs vehicles for socio-economic uplift of the local population. The state also has 3,000 km of rivers that play host to a wide variety of fish species. Snow-fed rivers are the most suitable for cold-water fish. To exploit the potential, the government introduced and popularised trout farming in the private sector. The state is producing over 50 tonne of trout annually. Efforts are afoot to develop the first mahseer farm at Badon in Jogindernagar at a cost of over Rs 5 crore, while a new farm on the bank of the Tirthan river at Hamini in Kullu is also being constructed at a cost of around Rs 2.5 crore. Commercial trout production touched 14.98 tonne in the public sector and 52.3 tonnes in the private sector during 2007-08. Despite tough eco-climatic conditions, fish seed production has attained a level of 20 million. The government is extending premium-free insurance cover of Rs 50, 000 to the licensed 11,000 fishermen families operating in the state. There are a number of schemes for reservoir fishermen, including accident insurance scheme, close season assistance scheme and risk fund scheme, to protect their interest. In all, 19 cooperative fishermen societies have been registered and Himachal Pradesh is the only state in the country where cooperative fish farming is being promoted. As per data collected by the government there is a vast network of these rest houses numbering 565 in various parts of the state. Another interesting fact that has come to light by way of this data is that while the government spent a whopping amount of Rs 20 crore on their upkeep and maintenance during the last three years, in comparison the earnings are a pittance and stand at anamount of Rs 2.59 crore. The main reason for the government to consider such option of throwing open rest houses of various departments for tourists has been the low occupancy in many places. “Barring the rest houses of the PWD Department, most of the other rest houses, especially in remote and far flung areas remain unoccupied for most part of the year,” an official said. Himachal has a very strong network of rest houses, some of them very old dating back to British time, which can be used in tourism promotion. The total number of forest rest houses in Himachal is 229, those of the PWD are 273, 53 of the electricity board and 10 of the Irrigation Department. He added that the step could broaden the scope of eco-tourism projects in the state, as some of these rest houses are located at ideal locations where other stay facilities are completely missing. Besides this, the move would help generate good amount of revenue for the departments. There is still no decision whether these rest houses would be opened for tourists or would be handed over to private entrepreneurs on a public-private partnership. “To begin with we will assess their occupancy individually and then see which can be converted into commercial complexes depending on their location in a particular tourist circuit,” said sources. The Forest Department has already identified some of its rest houses not just for being open for stay of tourists, but some of them along with other sites for are being offered under public-private partnership (PPP). In fact MoU for eight cases has already been signed and now new sites would be offered shortly. Ever since the creation of Eco Societies (ECO SOCS) under the Eco-Tourism policy in 2005, this is the first major leap that the government is taking towards promoting eco-tourism in a big way. The Rajya Mahila Ayog (State Women Commission) has been making strenuous efforts to ensure family reconciliation by mutual understanding and also sorting out of all complaints referred to it through repeated counselling so that the grievances of complainants are solved with agreement. This was said by state commission chairperson Ambika Sood while addressing mediapersons at Circuit House after conclusion of a two-day court of the commission here yesterday. She said during patient hearings here at Bilaspur town, the commission has amicably settled eight cases though it had 25 cases under its consideration. Remaining cases could not be settled because either any or both the parties were not present or some more time was required by the complainants to persuade themselves for amicable settlement. Ambika Sood said the commission was first set up in the year 1999 and since then total of 4,647 cases were referred to it for consideration and 4,375 cases have been settled up till now and only 272 cases are pending. She said the commission was visiting all districts and holding courts so that this helps the complainants to be readily available for appearance instead of going to Shimla that involves much more expenditure and inconvenience to them. Sood said most of the cases pertained to family feuds or quarrels between the spouses and were culmination of either drunkenness or unnecessary maltreatment and beating etc. She said women were now well read in most of the cases and they wanted equal partnership in all affairs and this created misunderstandings which could be solved by considered counselling. The chairperson, who was accompanied by two other members of the commission Urmila Gyan Bharti and Pawan Chaudhary, said the Commission would also hold camps for those committees which supervise against sexual harassment of women in their work places and would also ensure that protection officers appointed against family violence perform their duties properly and effectively so that it creates an impact to further check any such incidents. With the guidance and encouragement of an American researcher, the efforts of the youth of tiny hamlet of Beri in Chamba district have borne fruit and the handicraft items prepared by them are going to get recognition at the global level. Handmade herbal soap and candles manufactured by these youths will be on sale at an exhibition organised at the World Trade Fair in Dubai this month. The soap and candles prepared by the Ali Self-Help Group (SHG) will get international recognition. An endeavour was initiated in 2005 by some people under the supervision of their team leader Quasim Din of Beri village under the Palyoor panchayat. At that time, American resident Ramsey Charley, who was in the region in connection with his study work on the traditional life of nomad Gujjars, the people of the area got know-how about the process of making herbal soap. Members of the SHG also learnt the art of making candles using beehive remain after extracting honey from it. With assistance from the District Rural Development Agency, Chamba, the avocation of making herbal soap and candles found a new direction. The SHG undertook this work in collaboration with the Council for Advancement of People’s Action and Rural Technology (CAPART) of the Union Ministry of Rural Development. Five Congressmen namely Ranjeet Singh Verma, Ram Chand Pathania, MPS Rana, Kuldeep Pathania, and Tara Chand Chaudhary, besides Narender Thakur had formally applied for the Congress ticket for the Hamirpur seat. According to reports, though only three names: Narender Thakur, Ranjeet Singh Verma and Sunil Sharma have been recommended to the Congress high command by the Himachal Pradesh Congress Committee (HPCC) after its election meeting held at Shimla a few days back, but others aspirants are still trying to push through their claims. Since the Congress high command has still to come out with official declaration of the party nominees for all four seats of the Parliament from Himachal the scene has shifted to New Delhi now. The probable candidates from the state from all four parliamentary constituencies have already started contact programmes in their areas. A section of the Congress is also trying to push through the name of Sunil Sharma, district president of the Congress for the Congress ticket, from here and a few leaders are trying to use their clout in Delhi for this. Another aspirant of party ticket, Gian Sagar Prashar, son of former MP from Hamirpur late Narain Chand Prashar is also stated to be in touch with few top central leaders of the Congress party. 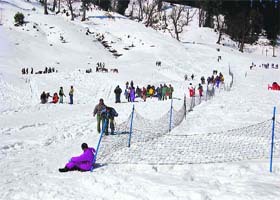 Keeping in view the Himachal Winter Games Championship to be held from February 15, the Solang ski slopes were covered with nets after it experienced fresh snowfall on February 6. This would protect it from visitors and other winter sports related activities on the slopes. After the snowfall again the weather remained dry in the region and the snow was melting very fast. To promote winter tourism in Kullu-Manali this year the Himachal Winter Games Championship will also be held along with the Manali winter carnival. Solang valley, 13 km north of Manali, offers one the most spectacular ski slopes in the western Himalayas and extensive views of the Pir Panjal ranges. This year the Solang ski slopes received the first snowfall on December 20, second on January 5 and third on January 18, but due to high temperature snow melted after one week. They were protesting against the alleged failure of the Jawali police in arresting Rajinder Singh, husband of the deceased, and four members of her in-laws. They raised slogans against the accused and the inquiry officer in the case. According to SDM Mohar Singh Chauhan, the protesters also submitted a memorandum to him seeking arrest of the accused by February 10. They had also demanded action against the erring police official, who, they alleged, had not arrested the accused even after rejection of their bail application by the high court recently. The protesters were led by zila parishad member from Jawali Amit Kumar. According to information, Shivani Guleria was declared Miss Kangra and married to Rajinder Singh of Una on February 22 last year. She allegedly committed suicide by hanging herself on January 21. The parents of the deceased had lodged a police complaint against her husband and four other members of her in-laws for allegedly harassing her after marriage and forcing her to commit suicide. Setting a record of appointments, 101-member District Congress Committee has been formed here with view to accommodating all sections of opinion. The list was released here recently in the presence of three district spokesmen of the party Kamlender Kashyap, Mast Ram Varma and Sat Pal Sharma. Vice-presidents are Amar Singh Thakur, Captain (retd) Ram Singh Chandel, Rattan Lal Chopra, Pratap Kaundal, Shankar Dass Kaundal, Kanshi Ram, Amarjit Kaur, Meeran Varma, Ram Krishan Dhiman and Yashoda Devi and Roshan Lal Bhardwaj is treasurer. General secretaries are Sarla Chauhan, Ram Saran Thakur, Bhagat Singh Varma, Ram Prakash Dhiman, Dinesh Sharma, Sukh Ram Kaushal, Pravin Chandel, Leela Sharma, Vikas Thakur and Rakesh Chandel. Organising secretaries are Surender Thakur, Rajinder Thakur, Balbir Singh Thakur, Amar Singh Dhiman, Manorama Chauhan, Kartar Singh Chaudhary, Suram Singh Thakur and Geeta Mahajan. District secretaries are Dinesh Sharma, Mool Chand, Nand Lal Sharma, Narendera Kumari, Anil Happy, Barfi Devi, Vijay Kaushal, Saroj Chadha, Saravjit Singh, Basheer Din, Meena Thakur, Shashi Kant, Yash Pal Chandel, Hem Raj Thakur and Achhari Devi. The list also disclosed the names of the district executive members. Jain said to implement the RTI Act it is important that all proceedings are duly recorded in the proceeding book and all records maintained properly since information under the Act could be sought for the last 20 years. He said under Section 4(1) of the PRI Act every panchayat is required to display all development works undertaken in the panchayat on a board depicting expenditure detail about the work so that every resident should know about it. Jain said the RTI Act would bring efficiency and transparency in their work and they should make it two-way communication. District panchayat officer Satish Sharma welcomed the DC and thanked the participants and said the department would organise more such workshop for the elected members of PRIs in the coming months. The Life Insurance Corporation (LIC) of India has declared Thpkour village of Gagwal gram panchayat in this subdivision as ‘Beema Gram’. Presiding over a function in this connection today in the village senior divisional manager, LIC, Shimla, LC Meena presented a cheque for Rs 25,000 to the local gram panchayat pradhan for undertaking rural development in the Beema Gram. The senior divisional manager said LIC used to declare that village as Beema Gram where at least 100 LIC policies were sold. He informed that Gagwal was the second such village in Nurpur subdivision as Kothi Banda village was first Beema Gram declared two years back. He claimed that people in the state had changed their opinion in investing in LIC policies and they were being attracted by a number of policies giving benefits to them on spending on kids’ studies, their marriages and even for their own old age. General secretary of the sangh Yash Pal said despite repeated assurances the government had not implemented the demand for revision of pay-scale as a result of which there was great resentment among the members. The raw deal being meted out the prathmik adhyapaks could be judged from the fact that their salaries had not been revised for the past seven years. They were being paid less than their counterparts in Bihar. They were drawing the pay-scale of Rs 4,500-6,000 in Bihar whereas they had been placed in the pay-scale of Rs 2,900-4,000 in Himachal. If the government failed to accept the demand the sangh would have no option, but to start statewide stir. He said a total of Rs 55 crore were being spent by the government for constructing roads in Bilaspur district this year.